obscene chewing: camping: a cautionary tale. 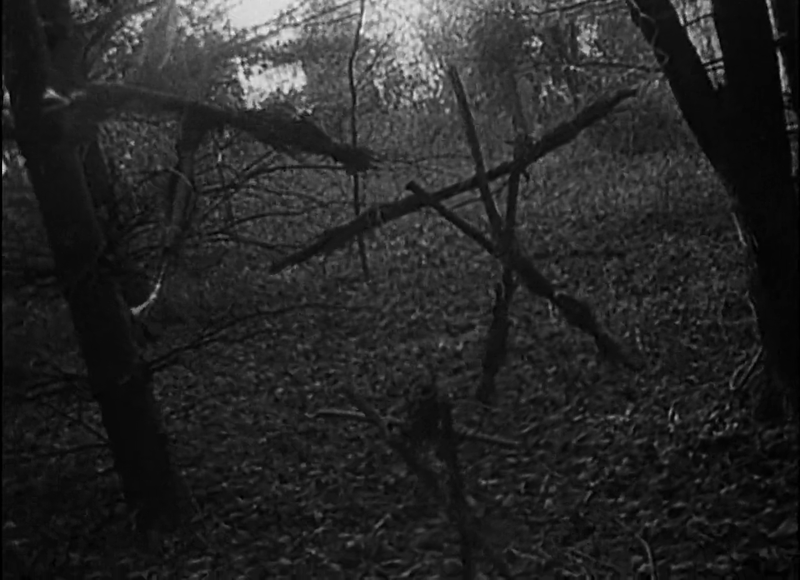 My ex's brother believed that The Blair Witch Project was exactly what it (fictionally) purported to be—found video footage of the last days of three young documentarians researching the legend of the 'Blair Witch' in the wilds of Maryland. At first it was difficult to grasp that a twentysomething man actually believed an amateur video of three persons' psychological disintegration and (presumed) death would be distributed for the vicarious thrills and casual entertainment of audiences worldwide. Now, of course, in the full bloom of the reality TV era, I realize how naive I was. It now seems entirely probable that—once the last inhibitions of reality television have been worn away—a snuff film will elbow a superhero franchise out of the top spot on the box office chart. I asked my ex why she didn't disillusion her brother; she shrugged me off. I'm pretty sure it was because she didn't want to embarrass him when she exposed him as preposterously gullible. It would be akin to the shame that a fourteen-year-old might feel when he discovers that there is no Santa Claus—and that all of his peers have known this for six years already. At any rate, he didn't seem overly distraught to be living in a world where the events of The Blair Witch Project could really take place. So we said to the sleeping dog: Lie. I had a hunch that—over a decade later—The Blair Witch Project wouldn't hold up to my initial (very positive) impression. I was wrong. I still think it's one of the best, most well-crafted horror movies out there—without requiring all the gore, pointless special effects, and genre frippery that's become a staple of the modern horror film. Blair Witch certainly has its detractors though—and many of them will point to the apparent nothingness of the film as its great fault. But that is precisely the key to its success, in my opinion. The film doesn't resort to another crude literalization of boogeymen but instead creates a pervasive feeling of dread by limiting what we see and what we know. We can't even mentally reckon with the evil of the film because, having never been seen or explained, it's always several steps ahead of our ability to come to terms with it. It's everything we can imagine all at once. I liked this when I saw it originally, but then I saw it again years later and it didn't pack the same punch for me. I feel the same way about those Paranormal movies (they always seemed kind of lame to me). You want to know what's NOT lame, though?? Again, a Spanish movie, similar "amateur video footage" premise. Called [REC]. AWWWWESOME! To be fair, most horror films don't pack the same punch the second time around since we know what happens. I haven't seen any of the Paranormal movies. I don't know why exactly. Humor me, Kowalski. Test your hypothesis before forming a theory. Okay, Morais. Consider yourself humored. But first I'll have to check into the availability of said film. David, we agree 100% on this movie. I never understood why it wasn't more widely appreciated, for all the reasons you state. YAY FOR US. We are wise. Are you taking requests/suggestions for your horror film marathon? John Carpenter's Prince of Darkness creeped me out. Maybe because I watched it alone, but still.. Prince of Darkness just happens to be on my watch instantly queue right now. I've heard varying things about it--but I plan on watching it eventually. Also please consider the 1982 movie The Beast Within. God I hate the word "prosaic." I can't believe this movie is over a decade old. I knew people that thought it was real, too; furthermore, my mother initially thought Jurassic Park was "real." After having read the book. The clearly identified as FICTION book. How ya like that genetic stock, mofo? Yeah. Your mother believes that dinosaurs were regenerated from DNA at a theme park? This explains so much about you. 'Prosaic' told me it hates you too. Scariest end to a film ever.